Step over lawn! 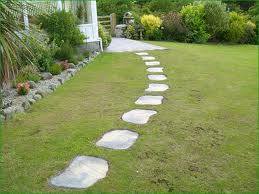 Do you end up with bare patches of lawn in the Spring thanks to walking on the wet grass over the Winter? Rather, than trying to repair them, put down stepping stones. They’ll be really useful next time the heavens open up!